Faucet brand Moen today announced that it will be "revolutionizing the shower experience" with the debut of "U by Moen," a cloud-based and Wi-Fi enabled shower system that brings mobile connectivity and personalized water preferences into the bathroom. The U by Moen shower is a valve system that needs to be installed professionally and will let users control water pressure through a "digital valve," which offers temperature control and the ability to connect up to four shower devices like showerheads, handshowers, body sprays, and more. The digital shower controller has a five-inch LCD screen that isn't touch-sensitive but provides feedback on the current status of a user's shower thanks to on-screen message notifications. 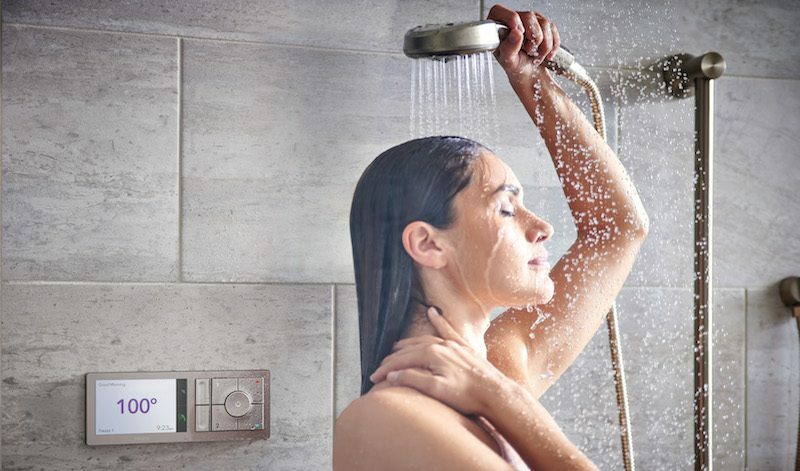 Moen said that the use of its new connected shower system can be found in everyday cases, like starting a shower from your bed to sleep in a bit longer, and setting a timer to shut the shower off for a family member that uses too much water. At Moen, we thought – why not connected water? How can we improve the overall experience with water by adding the benefit of smart technology?” asks Andy Conroy, senior director, wholesale marketing, Moen. “This idea led Moen to create U by Moen shower. The integration of a personal device allows users to control their shower preferences, customizing everything from time to temperature. A connected smartphone app lets users set up to 12 customized settings for a shower, and begin the spray of water before they enter so that the temperature can adjust to their liking. The screen of the digital controller adjusts with color-based visuals as the water gets colder or hotter, and a tone will sound when the desired temperature is ready. For safety reasons, only temperatures between 60 and 120 degrees can be chosen. Not only can users create their personalized shower experience from within the app, but they also can fully control the shower from their smartphones. They can turn on the shower, change temperature and turn outlets on and off with the push of a button. The app also allows users to customize system-wide settings, such as the outlet icons, which Wi-Fi network the system is connected to, language and time zone. Security is an important aspect of any connected device, and Moen has thoughtfully designed the U by Moen shower to give consumers peace of mind that their connection is secure. The finish of U by Moen is Terra Beige, and the company said that it is compatible with both two- and four-outlet systems. Users will have to provide their own fixtures and showerhead to go with the system. Moen didn't specify a launch date but mentioned that the device will be available to buy both online and in retail stores that sell plumbing supplies. Assume those degrees are Fahrenheit otherwise... ouch. "Need extra snooze time? Power on your shower from bed, and it will alert you when it's ready." How long does a shower need to get ready? Within seconds after turning on the water I can get in. This just sounds like a waste of water. the ability to connect up to four shower devices like showerheads, handshowers, body sprays, and more. A shower head is now a "shower device". I hate the future. Seriously what a joke this is. I can't see this making the life of the average person any better. Beyond that you don't always take the same shower daily. A good number of these IoT appliances puzzle me deeply. I just don't see any value in an internet connect shower, fridge or stove. Frankly it looks like an industry grasping at straws to find new places to sell their stuff. over engineered product for something that doesn't need a solution. Yep! I can't imagine who would buy such a thing. They don't state if a family subscription plan is needed in order to shower more than one person at a time. It depends on your water system. Always on water is common but many people still have to wait for their water to heat up in a morning. A cloud-based shower system is great news. But I'm looking big forward to their cloud-based toilet ventilator.